YAROSLAVL — The first HD-785-7 monster dump truck, strong enough to carry the equivalent of 45 adult hippopotamuses, rolled off the production line at Komatsu's factory on Thursday. Alongside other heavy equipment manufacturers in Russia like Caterpillar and BelAZ, the Japanese company is seeking to cash in on the expected boom in infrastructure and mining over the next decade. Each of the gigantic yellow dump trucks can carry a 91-ton payload and will set buyers back $1 million. Analysts said market growth for such machinery is expected to be between 5 percent and 8 percent a year and is underwritten in the long term by big extraction projects due to come online after 2020. Komatsu has sunk $150 million into its plant on the outskirts of Yaroslavl that opened in June 2010. With 236 employees, it is located in the region's Novosilki industrial park alongside construction giant Astron Lindab and Norwegian pharmaceutical outfit Nycomed. Built in the shape of an enormous narrow rectangle, by floor space the factory is Komatsu's biggest in the world. As well as the new dump trucks, it also has the capacity to produce up to 3,000 hydraulic excavators and 7,000 heavy-duty trucks every year. While none of the latter are currently in production, 2011 saw the manufacture of 800 excavators, each with a price tag of about $400,000. "We will develop our production in step with the development of Russia's infrastructure," Yasuhisa Tsukamoto, Komatsu's factory's director, told a crowd of journalists and local politicians Thursday. Contracts have already been signed for the first 10 HD-785-7s that will be shipped to the Kuzbass mining region of Ukraine. While the factory has an annual production capacity of 100 vehicles, expected output in 2012 is 50. A total 1,200 such 91-ton-payload dump trucks are produced worldwide annually. Firms like Komatsu and Caterpillar — which launched production of a new 55-ton-payload truck last month — compete at the high end of the Russian market. "Foreign machinery manufacturers are more advanced and more productive on a comparable basis — Russian machinery is cheaper and has a lower functionality," said Andrei Tretelnikov, a metals and automobile analyst at Rye, Man & Gor Securities. Tsukamoto was dismissive of the possibility that a slowdown in Europe precipitated by debt woes could have a serious negative impact on their Russian market. Komatsu is conducting research into the issue but the 2008 crisis had a negligible impact on industry demand, he said. A significant proportion of Komatsu's business comes through government orders that are traditionally less badly hit during hard economic times. Companies contracted to state-owned Gazprom working on gas infrastructure projects make up 20 percent of the factory's customers, Tsukamoto said. Prime Minister Vladimir Putin visited the plant shortly after its opening last year. 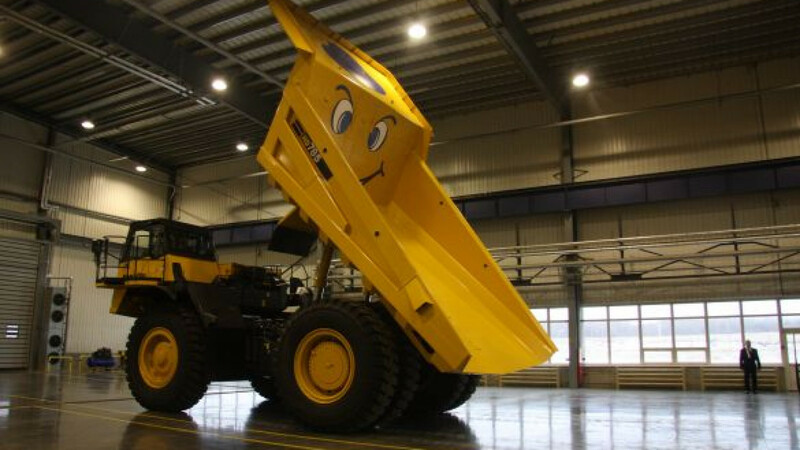 Yaroslavl region governor Sergei Vakhrukov said Thursday that, with the new dump truck, "today you can absolutely talk about the total rebirth of Yaroslavl's vehicle production." But while luring Komatsu to Yaroslavl was a political coup for the regional authorities, local sourcing of components is low. Masao Fujita, chairman of Komatsu in Russia and the CIS, told The Moscow Times that 10 percent of the parts for the HD-785-7 are made in Russia, while the company is aiming to achieve a 30 percent localization rate for its hydraulic excavators within six months. Severstal supplies the plant's steel, while the majority of the Russian-made components come from a joint venture Komatsu has developed in Ivanovo. Though Vakhrukov pointedly praised Yaroslavl's manufacturing pedigree in paints and engines, there is little chance that Komatsu will be turning to local suppliers any time soon. With the heavy-construction equipment industry receiving 1 percent of the order volumes that the automobile industry is seeing, the stimulus for more local sourcing is minimal. As it does for its factories in the United States and Britain, Komatsu ships all the engines for vehicles assembled in Yaroslavl from Japan. "Paints are possible," said Fujita with a smile, "but engines are rather difficult." Expenditure and borrowing will be closely watched. New rules will force Gazprom to hand over operation of the line.